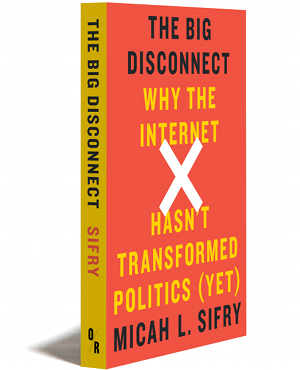 I’ve recommended Micah Sifry‘s latest book – The Big Disconnect – enthusiastically, ever since I devoured it after this year’s Personal Democracy Forum conference. Micah is one of ten AskThem advisors, the true founding supporter of OpenCongress, and a friend – excited for his & Andrew Rasiej’s next steps with Civic Hall, big ups NYC. “The Big Disconnect” by Micah Sifry, pub. OR Books (2014). – Micah relates the situation that occurred when a group of “myBarackObama” members called for surveillance reform, received an initial brief response, and then momentum & community for reform dissipated in that space- “ The question is why we let that happen.”, he asks. Excellent question, but in short, PPF’s social-benefit mission with AskThem is to provide an open platform – crucially, outside of government and any political party’s leadership – to continually raise bottom-up popular issues and continue the conversation once a petition threshold has been reached. This is not a guarantee of responsiveness, substantive dialogue, and continuing conversation – though those are indeed the goals – rather, just underscoring that our non-profit Q&A platform works for this accountability, by virtue of not going away after an election or when government wants to ‘close’ a conversation. Popular questions live on, on AskThem nationwide, towards continual dialogue. – My ongoing compliments to Micah in re-raising & articulating the issues of a public internet and broadband access – on the latter, PPF convened one of the first major public U.S. Loomio discussions ahead of PdF 2014 on municipal broadband in NYC, with participants including OTI of New America & more local infrastructure experts. We’d love to continue discussing open connectivity, for Mayor de Blasio’s broadband task force, and even stand up a Loomio group for all of NYC’s 51 city council districts for public deliberation on priority issues and more, with some charitable funding support. Shouts to Ben Knight & team, we agree Loomio is a tremendous platform and hope to see it grow far & wide in U.S. space. – Micah cites SeeClickFix, quite validly, as a success story in productive individual interactions with government entities around public goods, enabling peer-to-peer connections and real results, building community. Totally agree – but there’s vast potential here untapped – as most people reading this know, the great SeeClickFix app & service is build in part to integrate the 311 open data standard that governments agreed to intake, which in turn was supported & fostered by a tiny open-source developer community of Open311. If open data standards have successfully structured and networked the response to reporting potholes, couldn’t they do the same for more informational interactions with government – from questions, to policy preferences, to volunteer offers, to expertise? I’ve called this idea X11, to compare it with 311/411/511/911 protocols, and in addition to delivering individual political ideas into government towards an eventual resolution, it can channel political actions from closed social media into the networked public sphere (big regards to Prof. Benkler & team). – Second, Micah highlights a need for better listening tools – I agree, this is a ripe area for investment & innovation in civic tech. (Hey, Andrew Golis & team just launched “This”, which is like a “This is my jam” for content, n’est-ce pas?) I argued recently that official responses (via listening) to public political actions is what’s needed for civic engagement, and the most effective way to facilitate real engagement is open-source tools outside (or mostly-outside) of government. Imagine that in 2016 we have lots more Loomio instances, maybe Councilmatics in hundreds of U.S. cities, a hypothetical Liquid Democracy platform for U.S. political discourse (like DemocracyOS), more Madison instances for annotating legislation & laws, AskThem going strong nationwide, and even a fledgling X11 open standard for constituent communications. From all these tools, there’s incredible opportunity to provide government entities with open-source CRMs for analyzing this data – public sentiment analysis & determining priorities & heat maps & draft legislation – and then visualizing it online, and building an ecosystem of alerts & editorial content to continue productive conversation and close the loop on policy discussion. That’s a huge opportunity for non-profits and for-profit civic startups to provide the next generation of CRMs to government – investing in the infrastructure to make that possible now, by supporting the work of PPF and other non-profits, will help open up that data as widely as possible and ensure the participation tools developed on top of it are, at least in part, open-source for remixing. This is the argument I made in my follow-up post on civic tech funding structures – even headed into 2015, eight years into the contemporary open-government movement, there hasn’t been anywhere near comparable investment in open-source infrastructure for the types of thicker engagement Micah seeks to support. SeeClickFix is almost an anomaly, fortunately built first on top of open standards and responsibly active in the larger community, compliments to Ben Berkowitz & team. With any foundation support at all, PPF could take a crack at AskThem, Councilmatic nationwide and an open X11, and make possible much more innovation of alert & participation features. We’d welcome the opportunity to build these tools in best open-source, outside-activist fashion – I have specific software suggestions to pursue for government CRMs, with funding support. – Micah observes, “We need something like the NRA for the internet. People need to believe that the internet is such a fundamental part of their identity like owning a gun. We need internet lover’s leagues.” Well that sounds a lot – clearly, clearly, in its social thrust, not firearm-specificness, obvs. – like our sibling non-profit Fight For the Future! My friends there, who also co-founded PPF & PCF & more, are doing groundbreaking work on net neutrality campaigns to the FCC & popularizing the overall cause of digital freedoms. Micah is definitely a friend to FFtF also, he & Andrew Rasiej had my friends Holmes & Tiffiniy of FFtF on-stage at PdF2014 (can’t seem to locate the first morning mainstage event video in their YT playlist) to unveil their Reset The Net campaign for encryption as counter-measure to unchecked illegal domestic surveillance. So this isn’t at all a critique or corrective, just noting in a postive way, let’s praise the efforts of Fight For the Future and encourage civic engagement funders to help non-profits such as PPF continue our work next year. We can reach hundreds of thousands of people per month – ask a question to your city mayor, track an issue with your city council office, share a Facebook post with your city council district and deliver your petition signature into government for an open response – with a relatively small amount of nonprofit funding support. Feedback welcome, much more sophisticated notes are deserved from Micah’s talk – definitely read Micah’s book in full, it’s fast but substantively-researched & rewarding. We’re urgently seeking charitable funding support to continue operations – we think AskThem is filling a valuable niche in the U.S. landscape, and need a funding partner. Write me anytime, david at ppolitics dot org, @ppolitics on micropublishing service, and help us secure funding support to continue this productive work at Civic Hall next year. If #opengov community is taking a critical look at why free collaboration & information tech resources (email list-servs, social networking & micropublishing services, e-petitions, blogging and Wikipedia) haven’t yet widely improved voter turnout and small-donor percentages, maybe there’s one bright spot here in NYC, which has a public 6-1 matching funds campaign finance system. A 2012 Campaign Finance Institute paper on NYC’s system summarized that the small-donor match does increase number of small donors & diversity, though in one election it studied, overall voter turnout in NYC continued its trend by declining. Based on public financing like NYC’s, harnessing an increase in donors into wider voter turnout is a more practical challenge. Focusing on the tough metrics of voter turnout, competitive races, public trust (not quite the same as approval ratings, I’d argue) in government and small-donor percentages nationwide is still pretty daunting, though, as Micah acknowledges, in the face of pervasive gerrymandering and unlimited corporate donations in large races. The federal Congress is largely incapable of enacting basic electoral reforms, in its current incarnation, so state & local government must serve as the laboratories again. I’ve argued recently that the path to federal electoral reform goes through networking reforms (such as NYC’s 6-1 matching funds) at the city-government levels, up the chain to states, and then pressing a dramatic culture change. Also, just because there’s been a significant funding emphasis in open-data portals doesn’t mean we’ll see the results within two years or so – it may be over a dozen – and if funding for engagement infrastructure and participatory democracy hasn’t hit its peak yet (hopefully), then that field is just getting set-up. Perhaps in five years, every local government entity will have its own petition platform (like AskThem), full legislative transparency suite (like Councilmatic), public matching-funds system, real-time online campaign contribution disclosure, strong ethics regulations, and an open CRM for resolving constituent issues in an open public forum.